It’s been a good long time since I had one of those overwhelmed-by-emotions new-mommy moments. Maybe my hormones have finally found some semblance of balance (it has been six months) or maybe I’ve been just too darn busy to entertain them for any longer than a nanosecond. But last night I sort of felt the need to invite them back in. My husband was late getting home, so I was alone in getting baby ready for bed. I gave him a bath and put him in his super soft fleece pajamas before settling the two of us into the wooden rocking chair (yes, I’m old school) next to his crib. Normally, I would read to him as he nursed himself to sleep, but last night I decided to just listen to the Christmas music that was playing downstairs and rock. At one point I looked down to find that baby had drifted off to sleep. I ran my hand across the top of his head, smoothing his hair back into place. I then took my fingertip and traced the outline of his eyebrow, the bridge of his nose, and finally the little curve at the back of his neck. I don’t know what it was about this last little detail, but it triggered a sort of double helix of emotion–sadness and joy, wrapped tight around each other. See, baby is named after my brother, who we lost in 2000. It’s hard to believe that it’s been a decade already because I don’t miss him any less today than the day he died. In some ways I think I might miss him more because I know now all the things that he’s missed since he’s been gone. He officially died from complications following a liver transplant. However, the real underlying problem was that he had a very rare genetic immune disorder, a disease that has plagued my family genes for generations, passed uniquely from mother to son. For a long time, I feared that burying sons would be a family tradition. But by the grace of god, it turns out that I am not a carrier of this awful disease. So, as I sat there, looking at him by only the light of the lamp in the corner, the reality of this very simple thought really set in on me: I am not going to lose him. He will never have to know the fear or the pain that my brother (and actually my uncle, too) knew. Or develop the courage, the tenacity, or even the wit to be able to deal with it all. He will not have to take it one day at a time, making the most out of every enjoyable moment. This is not to say that he’s got a carte-blanche on life. But god willing, this will be the biggest, baddest bullet he’ll ever have to dodge. At the very least, it means that whatever happens as his life rolls out before him, this will not clip it short. And for all the new fears you develop the day you become a mommy, it’s such a giant relief to have at least one scientifically put to rest. So, as I take stock of my baby just days before his first Christmas, I see so many blessings wrapped up in this happy, healthy (and hefty) little boy that I know it’ll take me a lifetime to count them all. I don’t know what it is with my kid’s right foot and socks. No matter when, where, or what kind of sock I put on his right foot, within minutes (if not seconds) it’s off. Sometimes before I can even get the other sock on the other foot. This is of course a worrisome trend now that it’s winter. My mom bought baby some fun booties from Old Navy that I thought for sure would solve the problem. They’re not only cute, but warmer, longer, and heavier than a regular sock, so I figured they’d be harder to kick off. Just perfect for those chilly December days in D.C. when a snowsuit seems like overkill. So, the other morning I was feeling particularly motivated, so I packed up baby in his stroller and headed off to the gym. Baby was looking super cute in his fuzzy winter coat, polar bear hat, fleece pants, and booties. For added comfort, I had tucked a blanket in tight around baby’s thunder thighs. Paranoid that he’d be cold or that we’d have a bootie casualty, I stopped at nearly every corner and re-tucked the blanket. 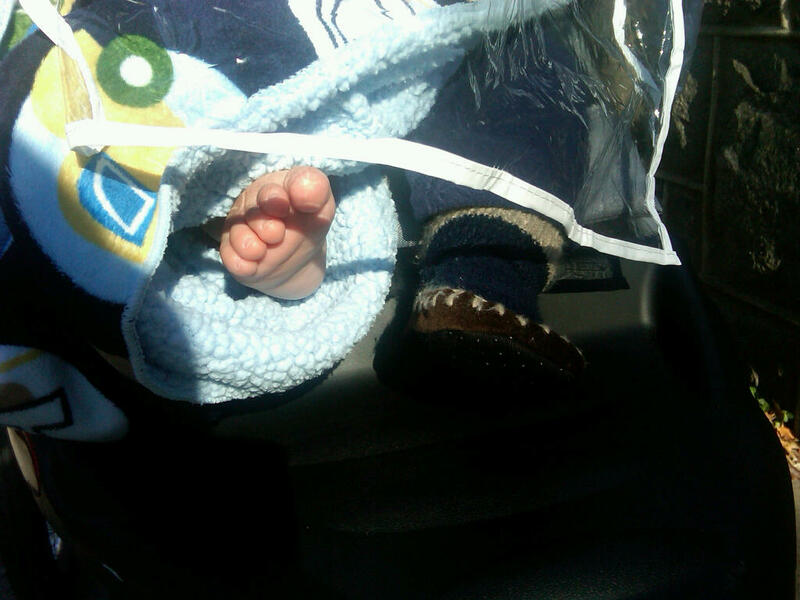 A block and a half from the gym, I stuck my hand under the blanket to be sure I felt two booties. Well, I must have been imagining things because as I undressed baby at the gym, the pudgy piggies on his right foot were bare as could be. 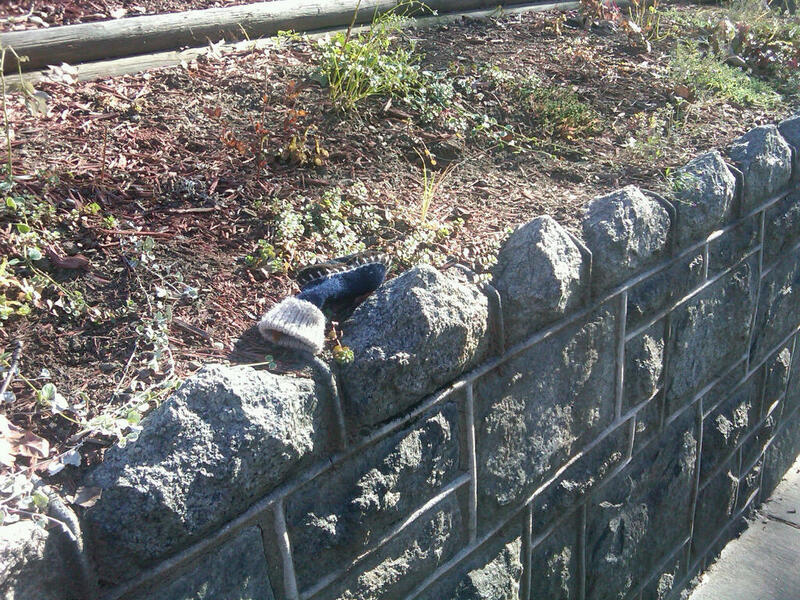 I hate to admit that something as simple as a missing sock could ruffle my feathers, but I was seriously annoyed. Hadn’t I made a super human effort to make sure the sock specifically did not go missing? And what were the chances of me finding it again? And darn, they were really, really cute. So, after my workout, I headed down the elevator to the Target to buy baby some more socks. I had already been there to stock up on socks earlier in the week, so I definitely was irritated to be spending more money on stuff I already bought. But the thought of baby’s little digits feeling a little nip on the stroller ride home made me decide to splurge on a few more pairs. Of course, within the course of my running in and out of the store, three people stopped me to tell me my baby was missing a bootie, leaving me feeling like an inadequate mother despite the fact that I was standing there with three pairs of socks in my hand. I can’t tell you how irrationally psyched I was to have found the long lost bootie. I mean, it’s a sock, after all. But somehow I felt victorious, as if I had outsmarted the universe. It was out to get me–and steal my baby’s bootie, no less–but I had not only persevered but triumphed. My step-mom used to keep a journal to help her deal with some of the issues she was going through as she battled ovarian cancer. After she died last year, my family got a chance to peek inside.